If predictions about global warming are at all accurate, large areas of East Anglia may be underwater in a hundred years time. But it was hard to worry too much about global warming in the summer of 2005. Far from overheating, eastern England was suffering day after day of cloud and drizzle; the only water around was falling from the sky. 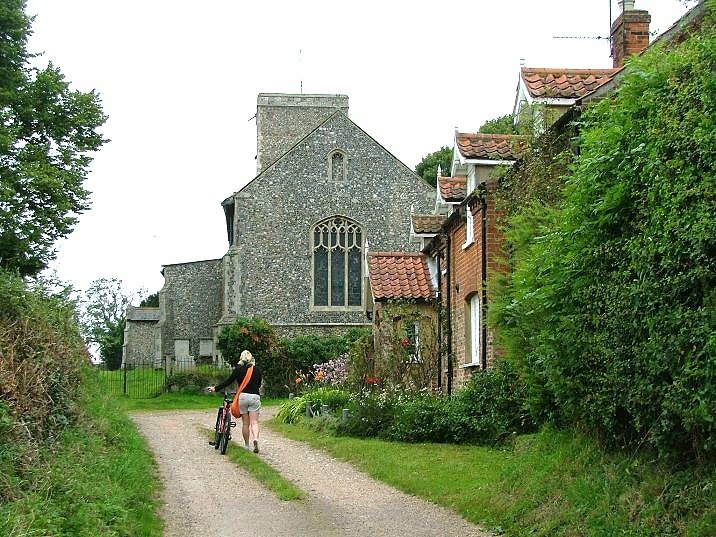 Cycling around the county was a hit and miss affair, and there are several Norfolk villages that I will always remember visiting for the first time in the rain. Marsham is one of them, I'm afraid. 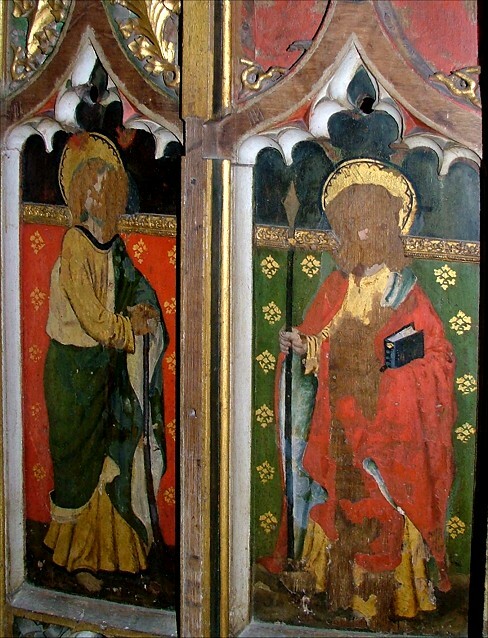 But All Saints went some way to making up for the weather. 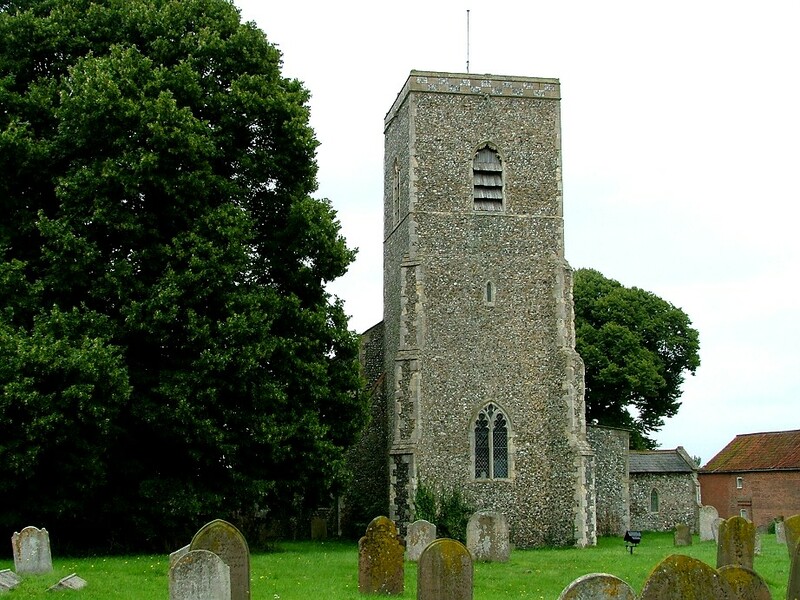 Great churches, famous churches, of which Norfolk has several, are usually those that appear spectacular even to uneducated eyes, with contents that we can all be in awe of, because they are 'beautiful', or 'really old'. There are lots of these. 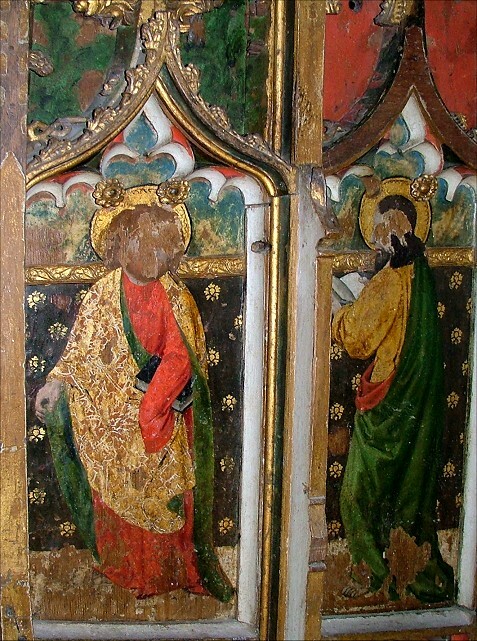 There are plenty of other churches that most people would pass without a second glance, but a few of these are full of interest - at least, to those who know what to look for. A few of them are of outstanding interest. 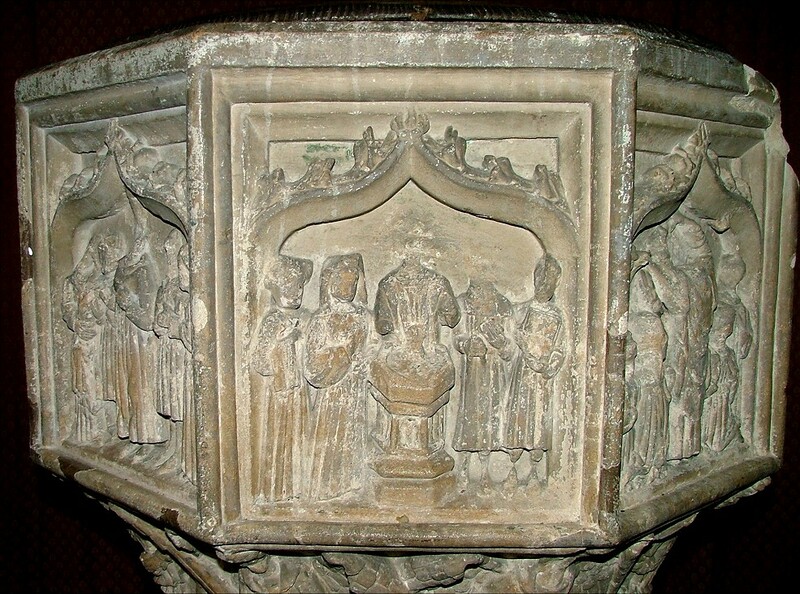 All Saints, Marsham, is one of these. I think it is an outstanding church. 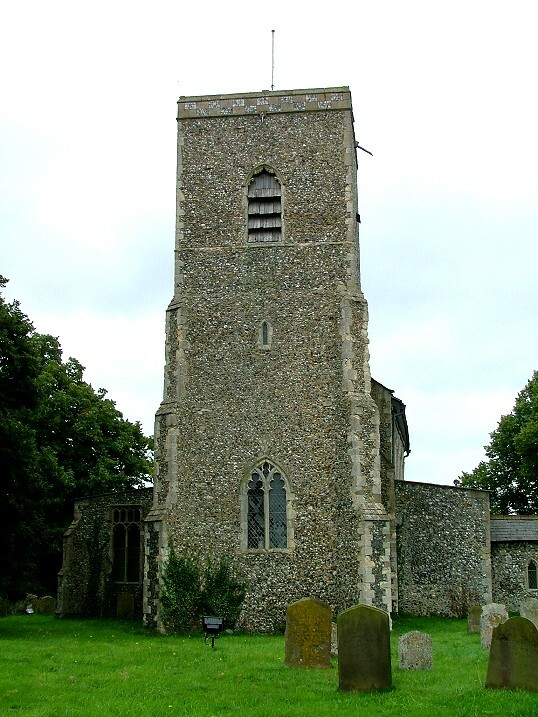 From the south-east it is a typical late medieval East Anglian church, with aisles and a clerestory - but these fold themselves modestly behind the tower when seen from the west. 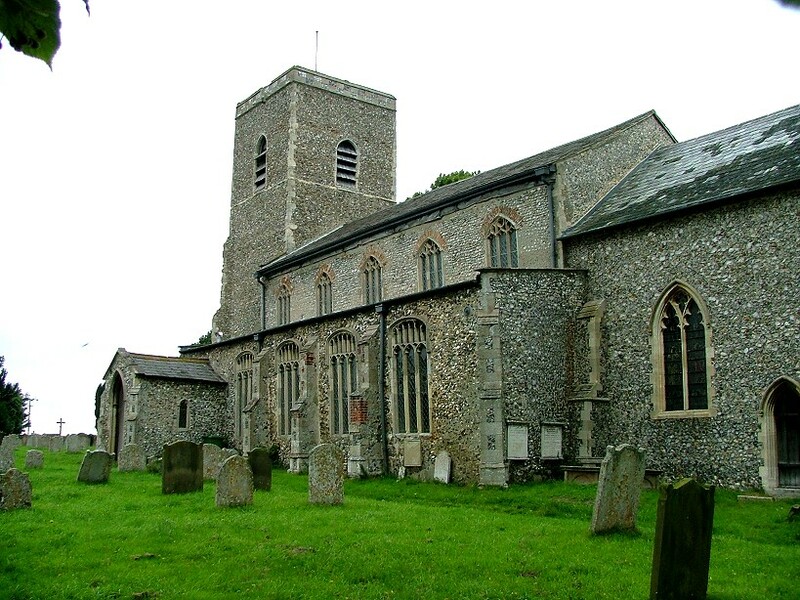 Marsham is a large, busy village on the Norwich to Cromer road, with a fine pub; but the church is set back from the road at the south of the village, and you approach it up a narrow lane, past 19th century cottages. 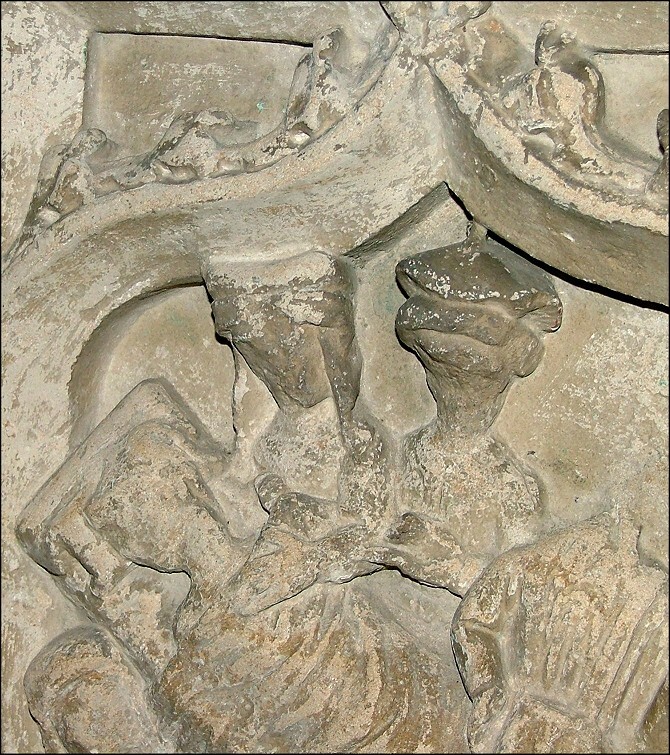 A niche above the east window faces the road, and in medieval times the statue it held would have been the last thing seen by parishioners setting out on the long journey to Norwich, London, and beyond. The tall, single storey porch has an entrance that is nearly as high as itself; the wooden roof inside is gaily painted. You step through the south door into a dark, secretive building. I said at the start that this church was outstanding. 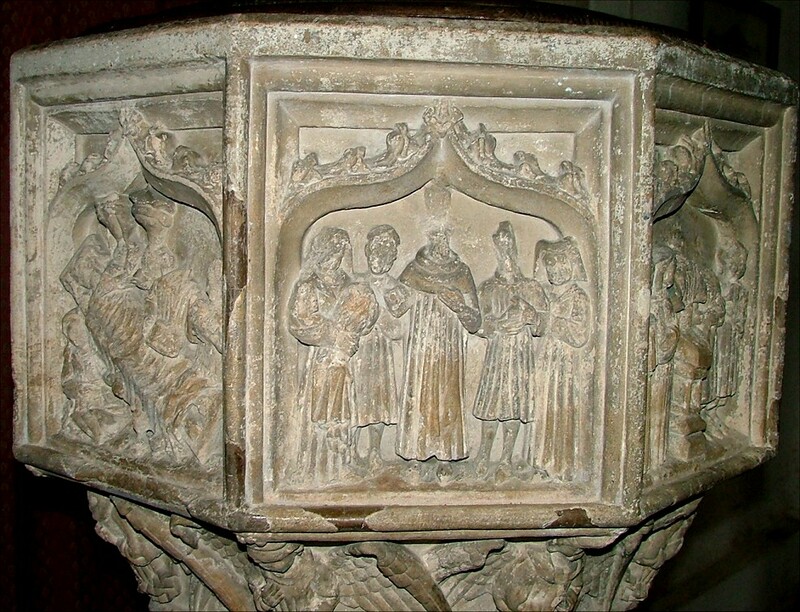 This is because it has a huge number of medieval survivals of the highest quality. And yet, it is little known. 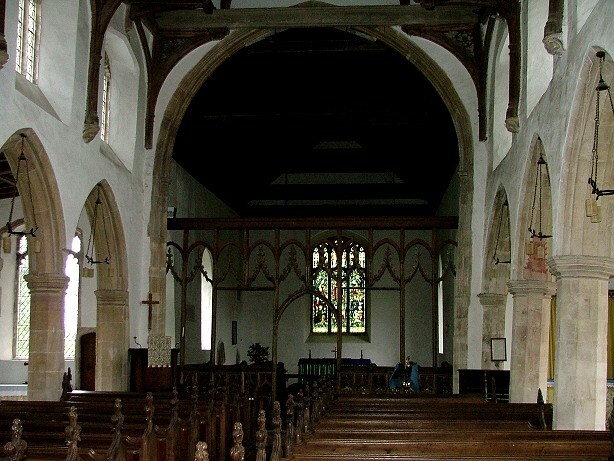 Perhaps it is because it is not a spectacular interior. 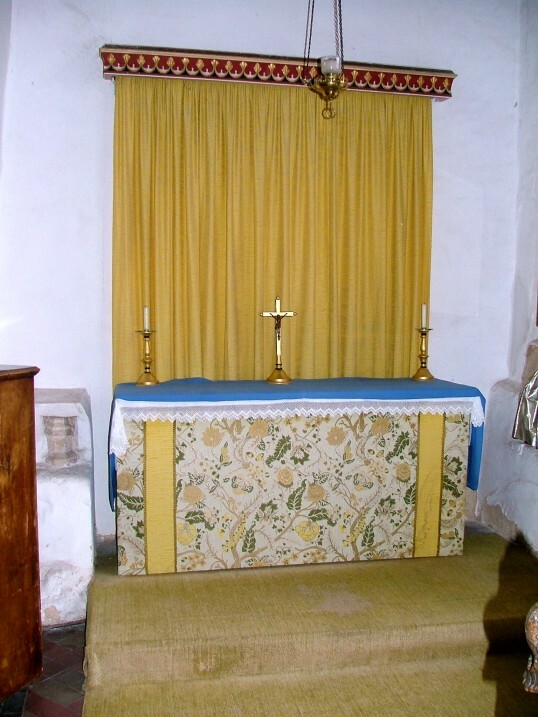 It is not bright, or colourful, or even particularly atmospheric. 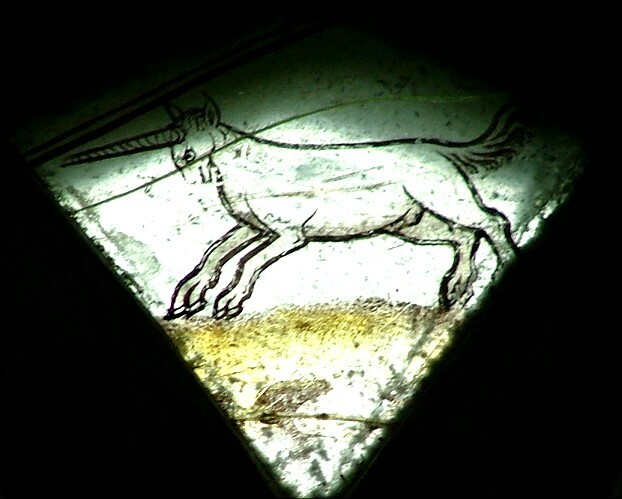 It is not so much secretive as deceptive; it would be easy to dismiss it, but to wander around is to encounter wonders. The first great survival greets you as you enter the door. 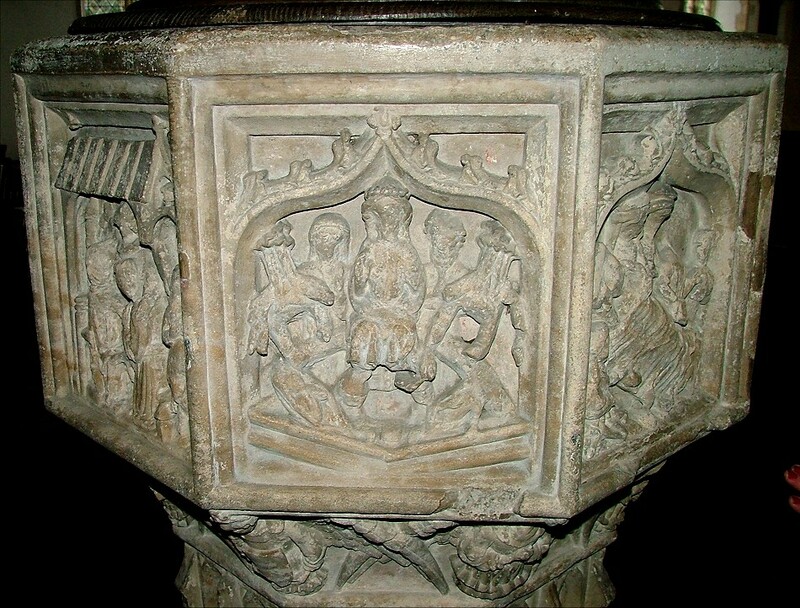 This is one of Norfolk's twenty-odd Seven Sacrament fonts. 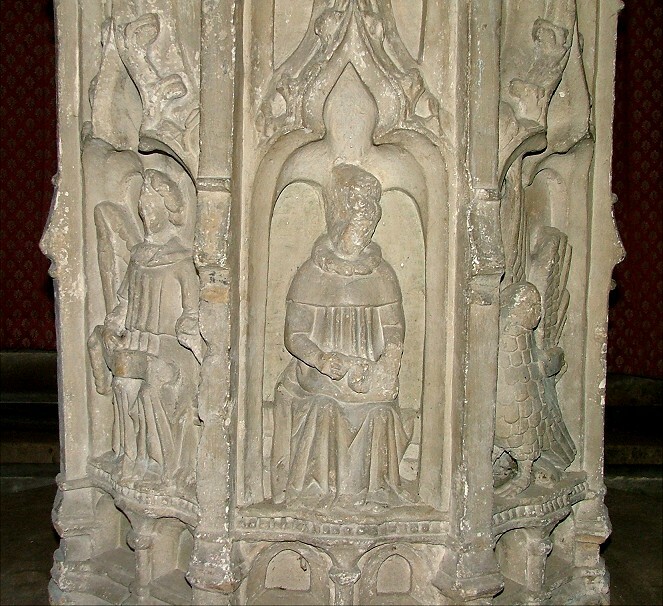 It is tall, elegant, and a bit like the one nearby at Burgh-next-Aylsham. 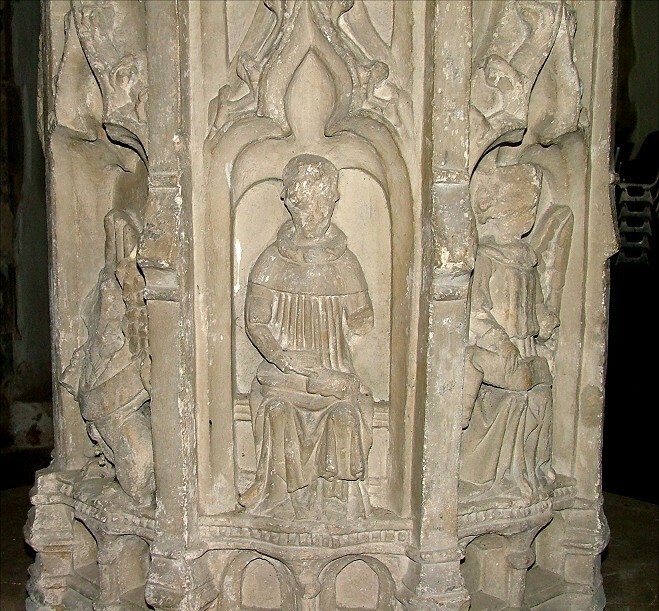 But the difference here is in the quality of the carving, and the extent to which it has been lightly vandalised. 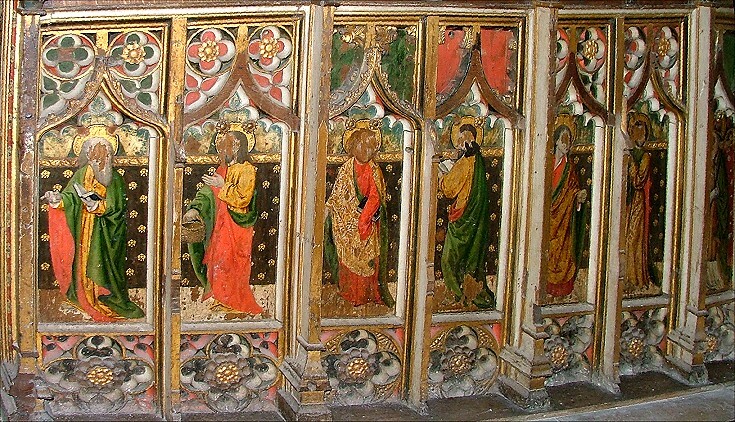 The characterful details are superb, not least on the eighth panel, which here depicts the Last Judgement. 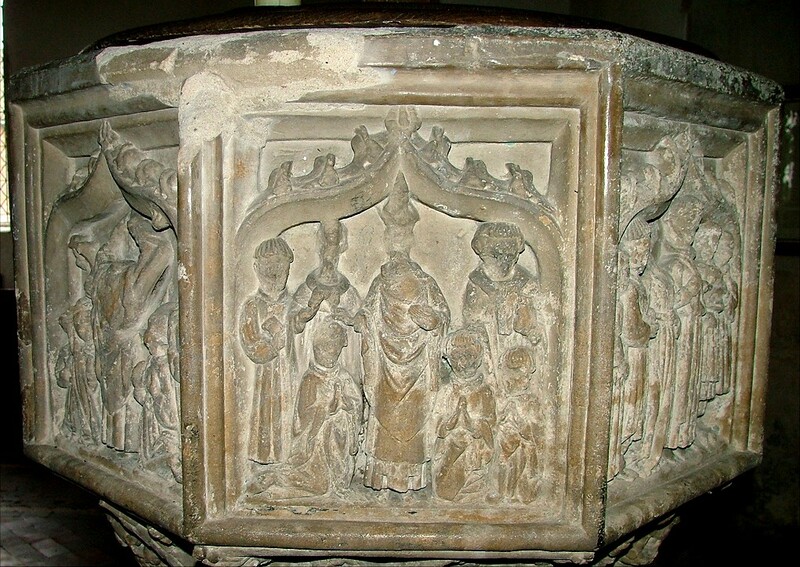 Anti-clockwise from the east, the panels are : Baptism (E), the infant being fully immersed; Mass (NE), the Priest with his back to the viewer, facing the altar, the sanctus bell being rung on the left; Ordination (N), with three kneeling ordinands; Matrimony (NW), curiously the bride's head has been destroyed, but not the others; Confession (W), another curiosity, the scene set beneath a canopy representing what may be the Holy House in Nazareth; The Last Judgement (SW), Christ sits on a rainbow flanked by Mary and John, while at his feet, the dead rise from their coffins; Last Rites (S), with a mourner in front of the bed and Confirmation (SE), as usual of an infant in arms. 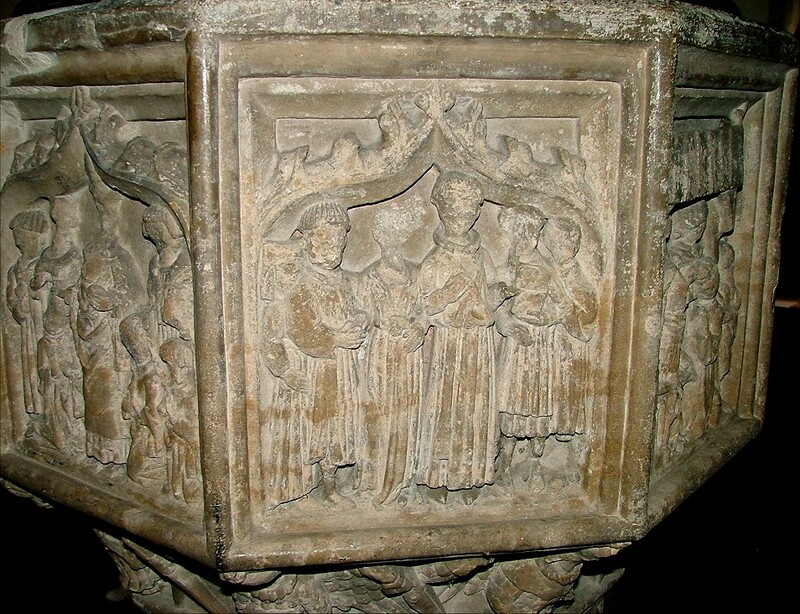 The pillar of the font features alternating angels and evangelists; hover over the panels below for descriptions, and click on them to enlarge them. 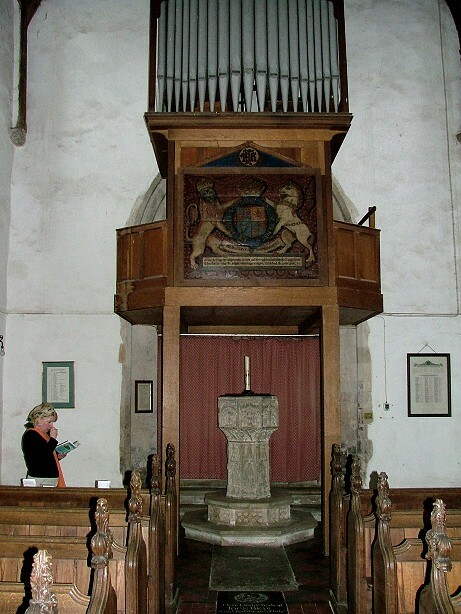 Above the font is a tall organ gallery, and on it is a handsome set of royal arms. 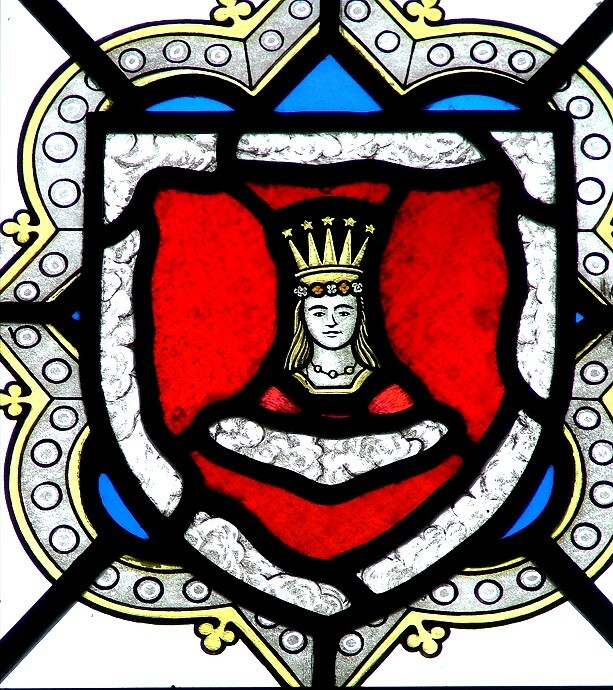 They are a rare survival, the arms of James I, with a quotation from Psalm 72: Give the Kinge thy iudgements O God and thy righteousnes unto the Kinges lorre: then shall he iudge the people accordinge to righte, and defende the poore. 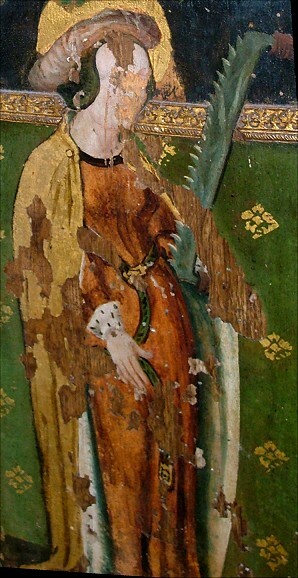 The lion and the unicorn are depicted as particularly male. 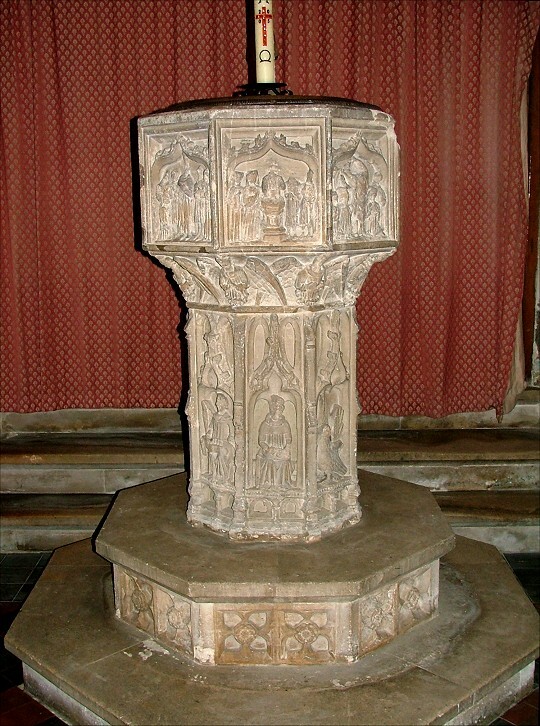 Until the 1880 restoration, the font stood in the north aisle by the second arcade bay from the west. 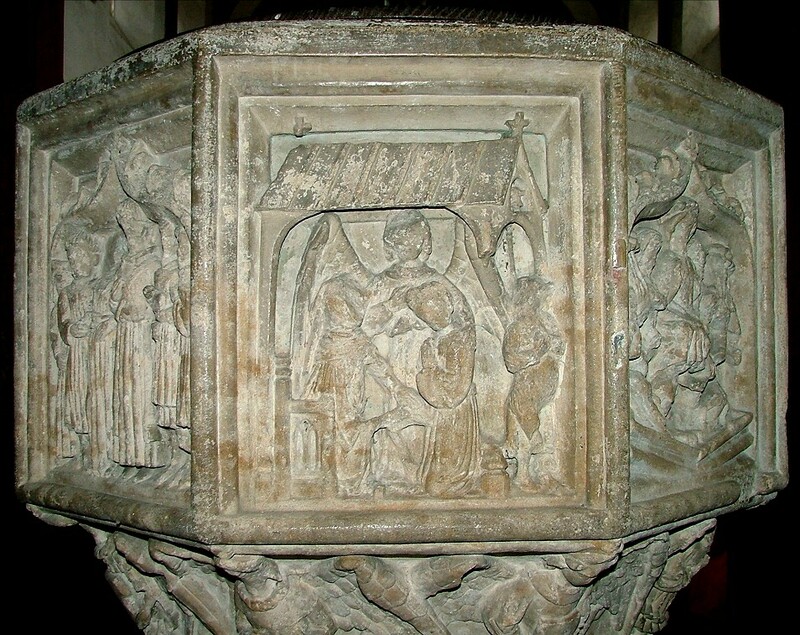 You can still see the fixing for the font cover. 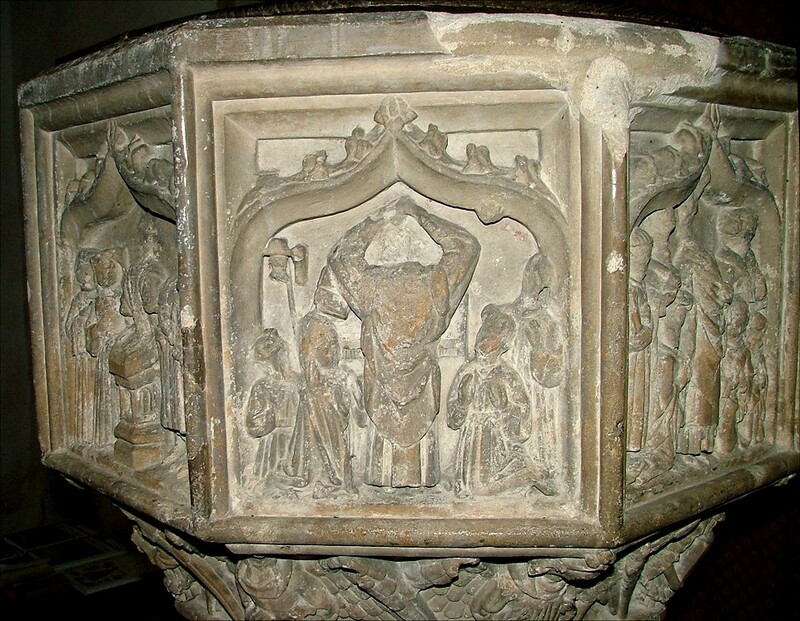 At one time, the fixing was shaped like a boy's face, the so called 'laughing boy of Marsham', but both boy and font cover were lost in the restoration. 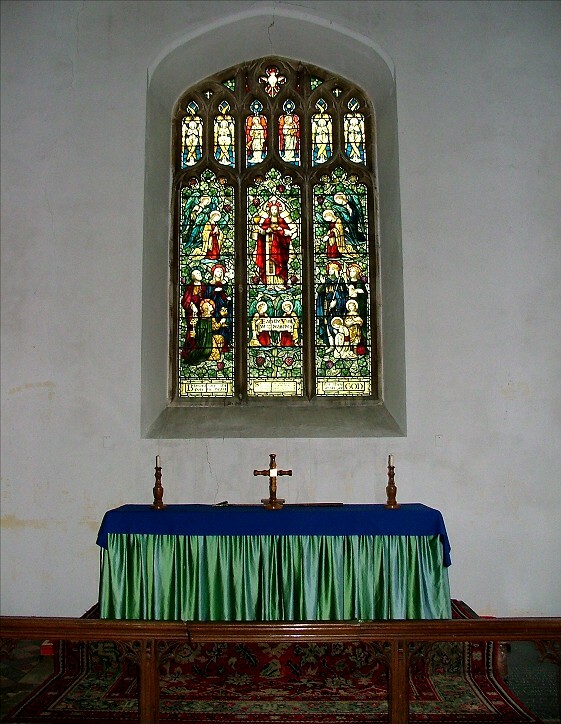 The nave windows have fragments of medieval and continental glass, but they are unusual. 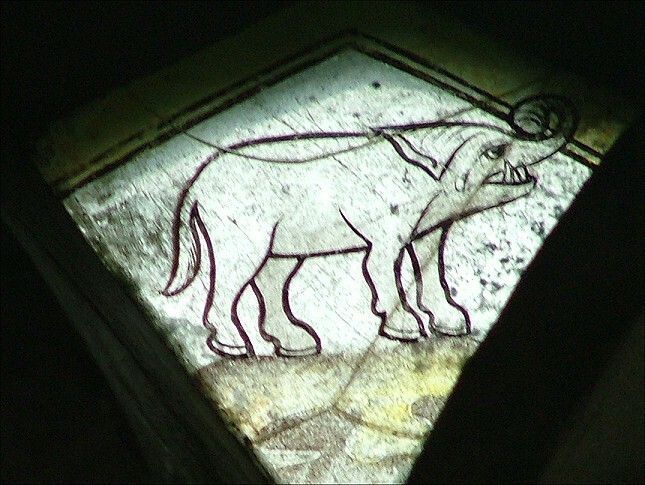 Set in two small lights in the north aisle are an elephant and a unicorn, the only two in stained glass anywhere in East Anglia. 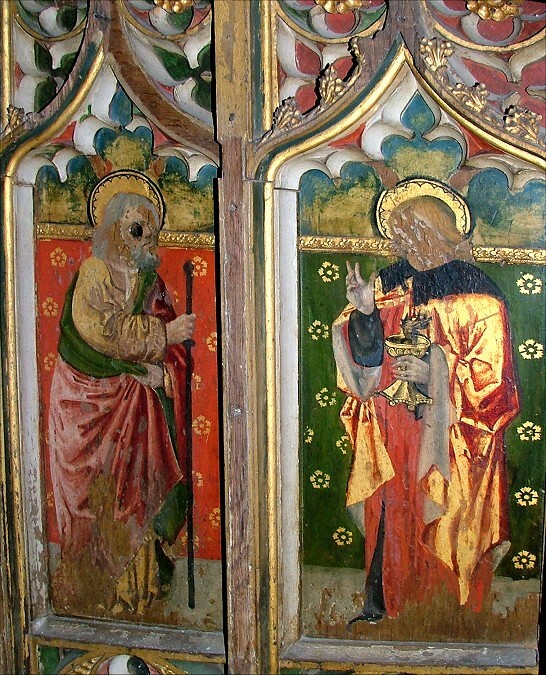 There are also a couple of figures in the south aisle, King David and Judas Maccabeus. 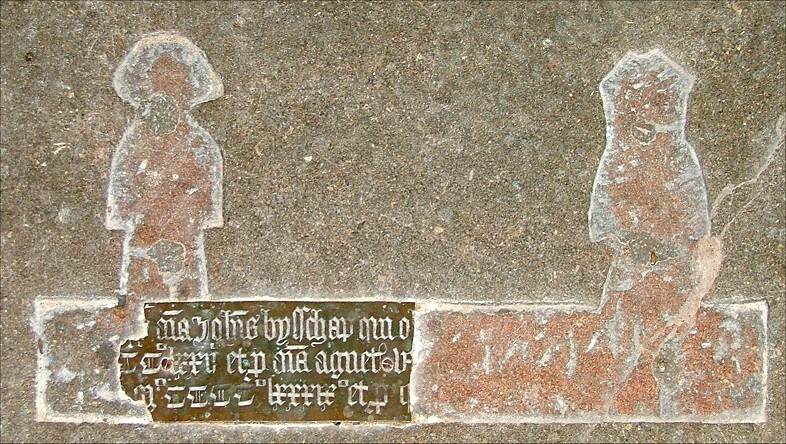 They came from Bolwick Hall, and were placed here by the Mercers' Company whose arms are now between them. 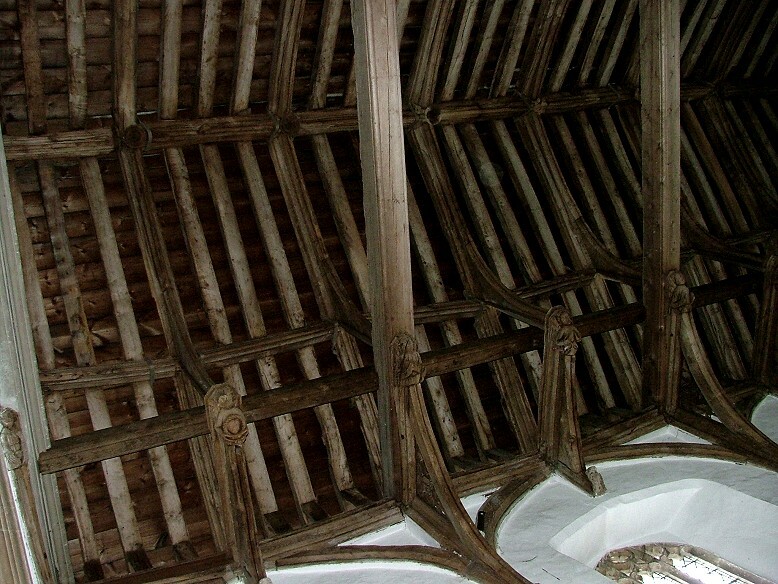 Up above, the hammerbeam roof is a fine late medieval example, but this church began to spread in the eighteenth century, and solid oak tie beams were put in to stop it collapsing. 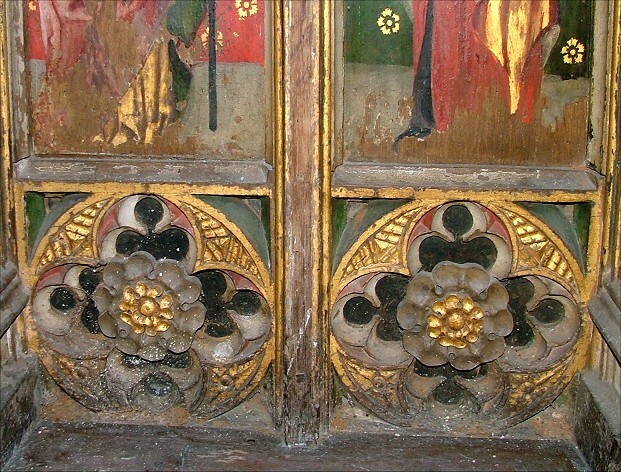 They are a curious contrast with the delicacy of the woodwork above. 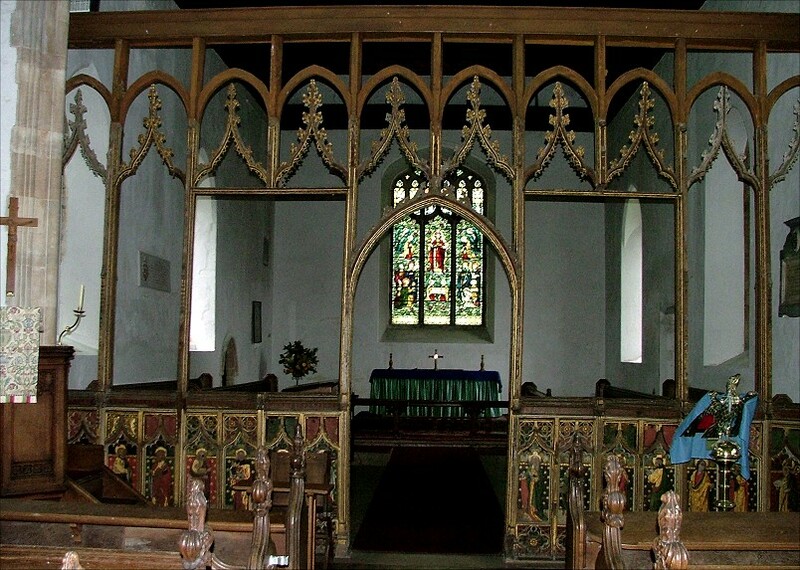 The best woodwork here, though, is the screen. 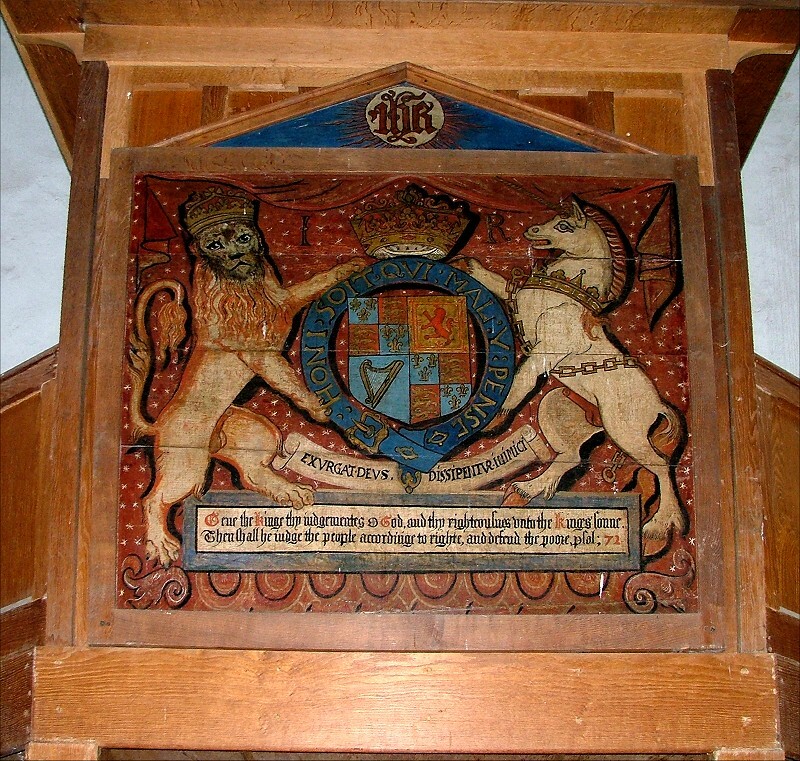 It is by the same workshop as those at Aylsham and Suffield, and dates from the start of the sixteenth century. 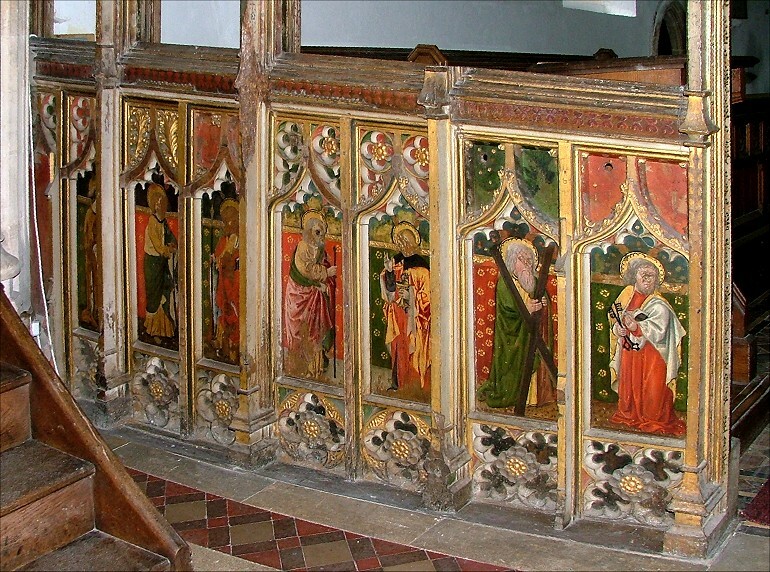 Unusually, the dado panels depict an odd number of figures on each side, just seven, the two outer panels being hidden behind the chancel arch and left blank. 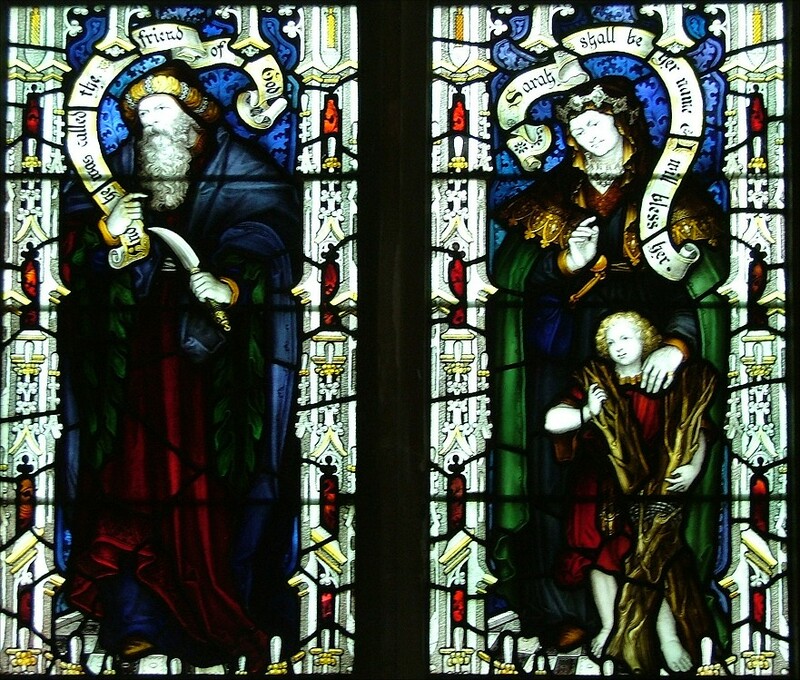 On the north side, the figures are St Faith with a saw, St James the Less with a fuller's club, St Thomas with a lance, St James with a staff, St John with a poisoned chalice, St Andrew with a cross and St Peter with his keys. 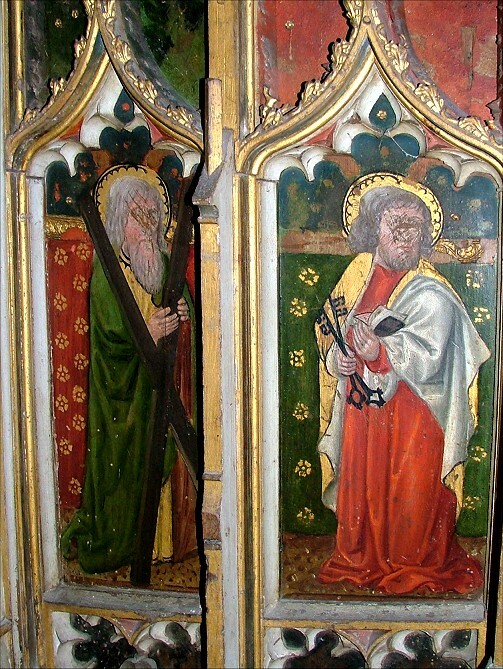 On the south side are St Paul with a book, St Philip with a basket, four figures apparently without symbols and then a Bishop who may be St Thomas of Canterbury. 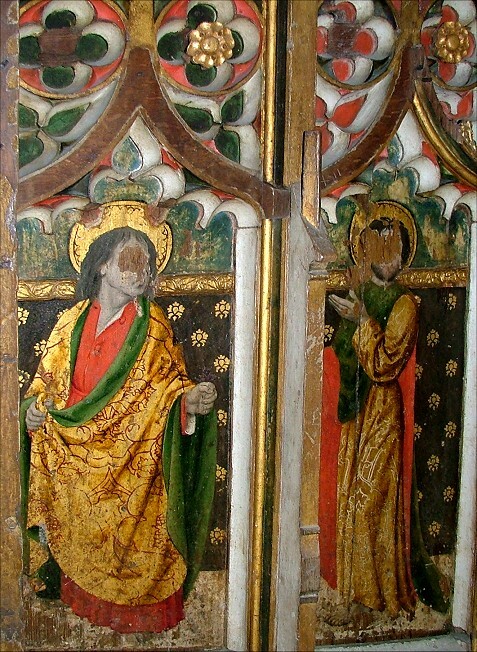 Curiously, St Paul should also have a sword, and his hand appears to be in the attitude to hold one - but it isn't there. 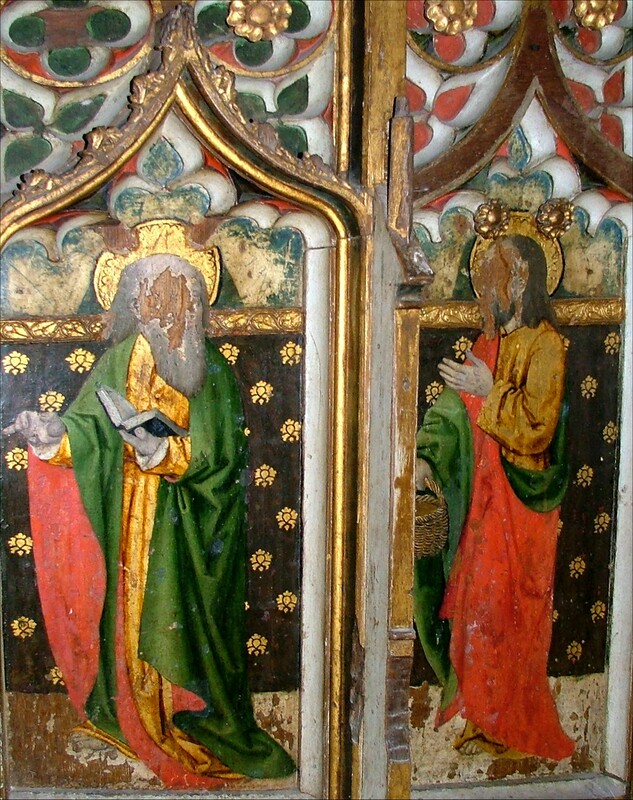 Similarly, some of the hands of the four figures without symbols look as if they are in attitudes of holding objects - could it be that the screen is unfinished? 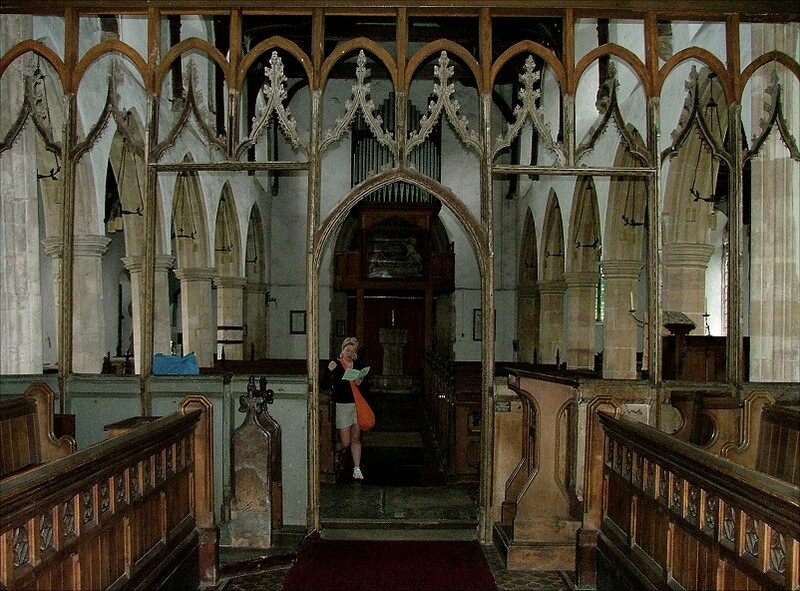 The gorgeous upper tracery of the screen hangs like foliage, an echo of the forest of branches in the roof above. 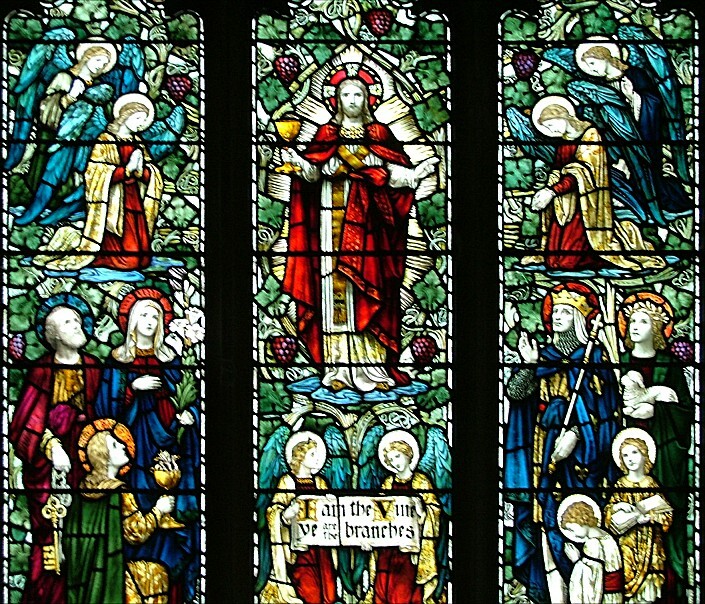 The dim light is partly because of a profusion of 19th and 20th century glass, but some of this is very good; the east window, a meditation on I am the vine, ye are the branches, is a fine composition including angels and Saints including a lovely St Agnes. 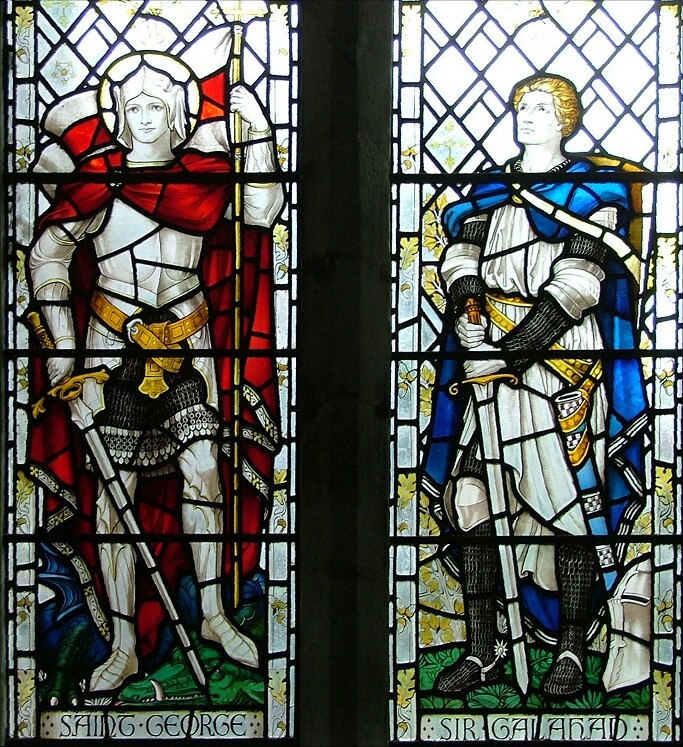 The war memorial window features St George and, more unusually, Sir Galahad from the legend of King Arthur. 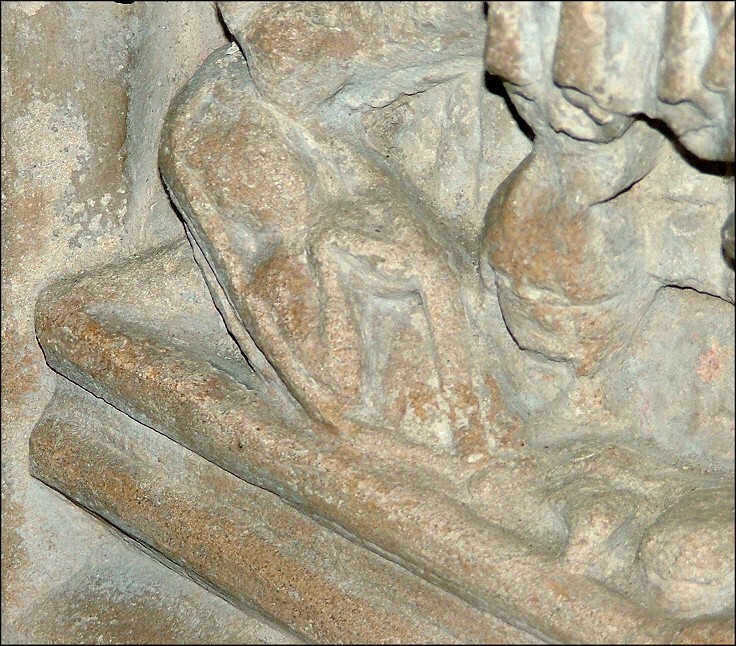 Another curiosity is Abraham and Sarah, with the infant Isaac at her feet carrying his bound branches in an echo of the saltire cross on the screen. 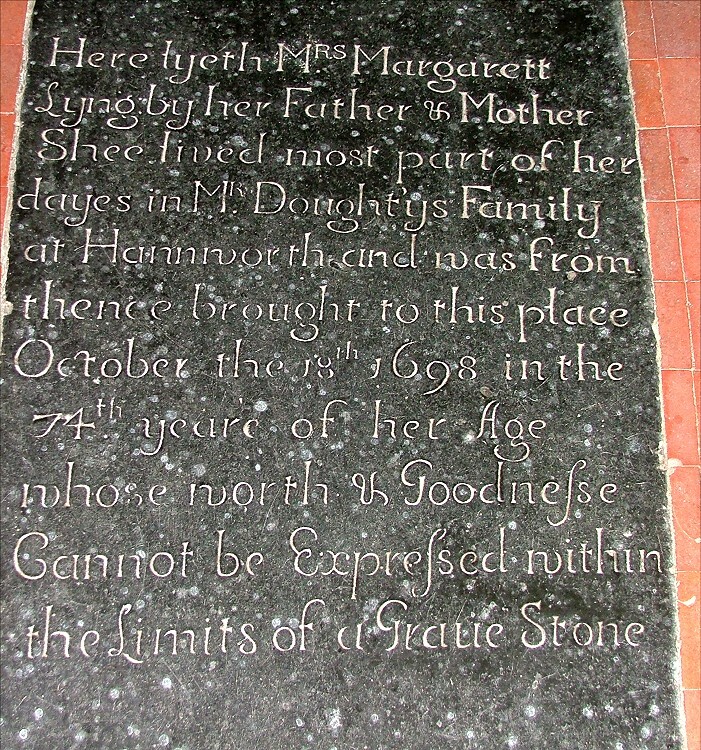 Coming back into the nave, two ledger stones are worthy of note; one, for Mrs Margaret Lyng who died in 1698, records that her worth and goodnesse cannot be expressed within the limits of a gravestone. 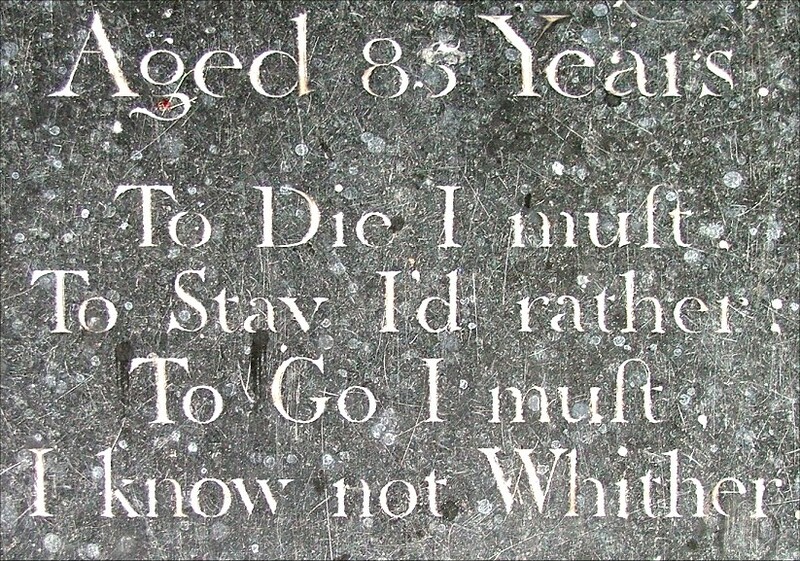 Perhaps more honestly, another nearby observes that To die I must, to stay I'd rather, to go I must, I know not whither. 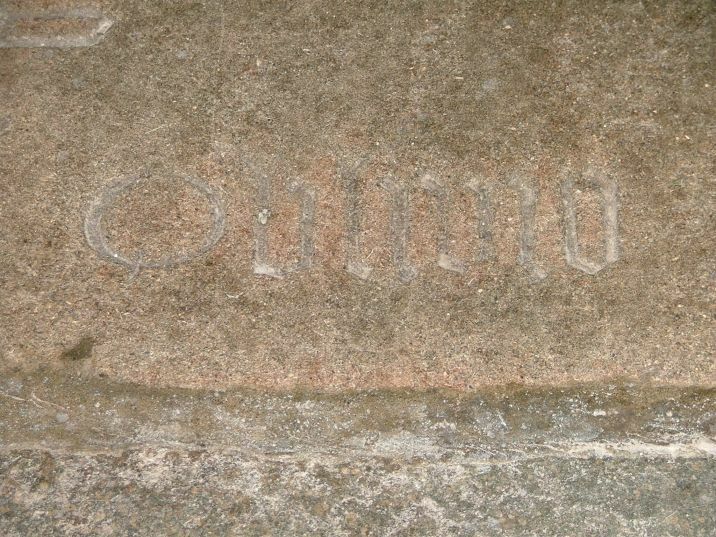 A much older stone towards the chancel is engraved around the edge with the word Oblivio ('unknown') repeated eight times. 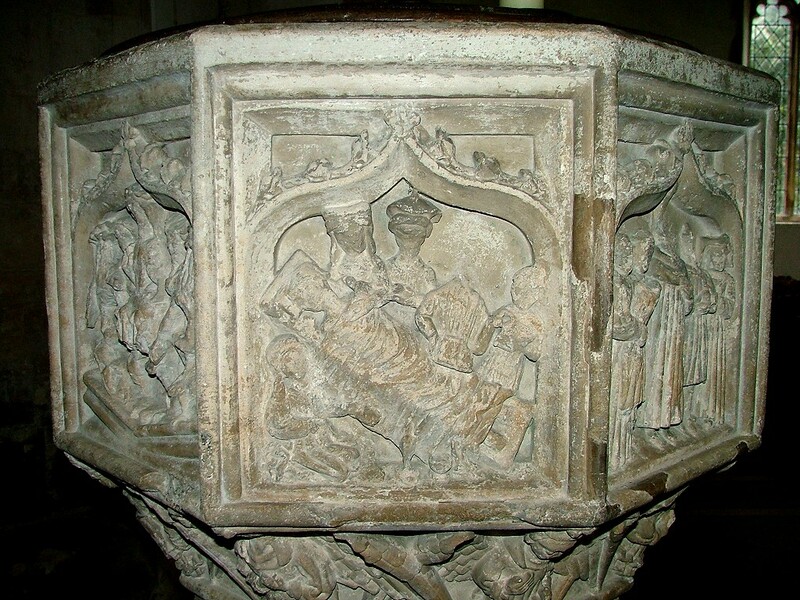 The Latin inscription says, I am told (I couldn't make it out myself), "You shall never know my name for I am condemned to oblivion as having been dead in the heart." 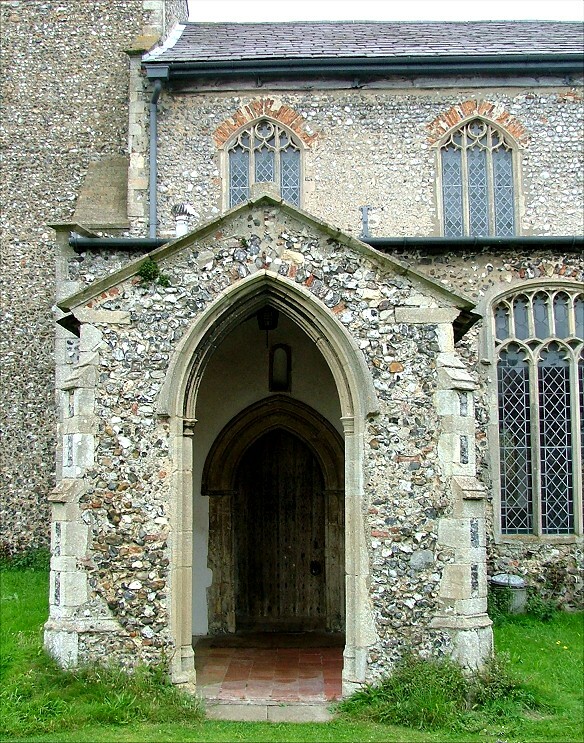 A building full of interest, then, which deserves to be as well-known as some of Norfolk's more famous churches.